Why we organize our personal digital data the way we do and how design of new PIM systems can help us manage our information more efficiently. Each of us has an ever-growing collection of personal digital data: documents, photographs, PowerPoint presentations, videos, music, emails and texts sent and received. To access any of this, we have to find it. 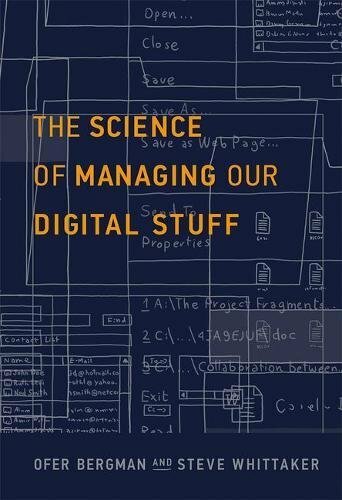 The ease (or difficulty) of finding something depends on how we organize our digital stuff. In this book, personal information management (PIM) experts Ofer Bergman and Steve Whittaker explain why we organize our personal digital data the way we do and how the design of new PIM systems can help us manage our collections more efficiently. Bergman and Whittaker report that many of us use hierarchical folders for our personal digital organizing. Critics of this method point out that information is hidden from sight in folders that are often within other folders so that we have to remember the exact location of information to access it. Because of this, information scientists suggest other methods: search, more flexible than navigating folders; tags, which allow multiple categorizations; and group information management. Yet Bergman and Whittaker have found in their pioneering PIM research that these other methods that work best for public information management don't work as well for personal information management. Bergman and Whittaker describe personal information collection as curation: we preserve and organize this data to ensure our future access to it. Unlike other information management fields, in PIM the same user organizes and retrieves the information. After explaining the cognitive and psychological reasons that so many prefer folders, Bergman and Whittaker propose the user-subjective approach to PIM, which does not replace folder hierarchies but exploits these unique characteristics of PIM.